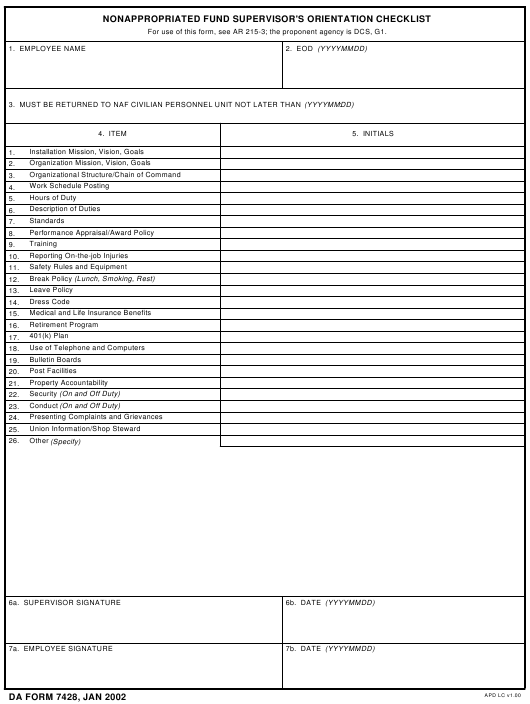 DA Form 7428 - also known as the "Nonappropriated Fund Supervisor's Orientation Checklist" - is a United States Military form issued by the Department of the Army. The form - often mistakenly referred to as the DD form 7428 - was last revised on January 1, 2002. Download an up-to-date fillable PDF version of the DA 7428 down below or look it up on the Army Publishing Directorate website. Nonappropriated Fund employment. Have the employee initial the spaces provided after each item has been explained. 1. Installation Mission, Vision, Goals. Explain to the employee and provide a copy if available. 2. Organization Mission, Vision, Goals. Explain to the employee and provide a copy if available. 3. Organizational Structure/Chain of Command. Self-explanatory. 4. Work Schedule Posting. Show employee where work schedules are posted and how often they are published. 5. Hours of Duty. Self-explanatory. 6. Description of Duties. Self-explanatory. (remember standards must be measurable). 8. Performance Appraisal/Award Policy. Explain performance appraisal to the employee and how performance is rewarded. 9. Training. OJT and formal training that the position requires or is mandatory for the installation if applicable. 10. Reporting On-the-job Injuries. Explain the procedures an employee must follow if ever injured on the job. 11. Safety Rules and Equipment. Self-explanatory. 12. Break Policy (Lunch, Smoking, Rest). Self-explanatory. 13. Leave Policy. Explain the activity's leave procedures. 14. Dress Code. If applicable. 15. Medical and Life Insurance Benefits. Ensure employee has been made aware of the benefits available. 16. Retirement Program. Ensure employee has been made aware of benefit. 17. 401(k) Plan. Ensure employee has been made aware of benefit. 18. Use of Telephone and Computers. Self-explanatory. 19. Bulletin Boards. Ensure employee knows where they are and the types of information posted there. 20. Post Facilities. Explain to employee what post facilities they may use as a NAF employee. 21. Property Accountability. Hand receipt, equipment, etc. for which employee is responsible. 22. Security (On and Off Duty) . Self-explanatory. 23. Conduct (On and Off Duty) . Self-explanatory. 24. Presenting Complaints and Grievances. Self-explanatory. 25. Union Information/Shop Steward. Where applicable. 26. Other. Any requirements unique to the organization.